UNCASVILLE - Six years after construction on the Innovation boys basketball program began, senior Lenny Okonya stepped off the floor for the final time as a Raven and pointed at his ring finger, beaming toward fans sitting behind the team’s bench. The lightning-quick ascension of the Ravens’ program culminated on Sunday, as Innovation defeated Old Lyme 62-41 to win the Division V state championship at Mohegan Sun Arena. 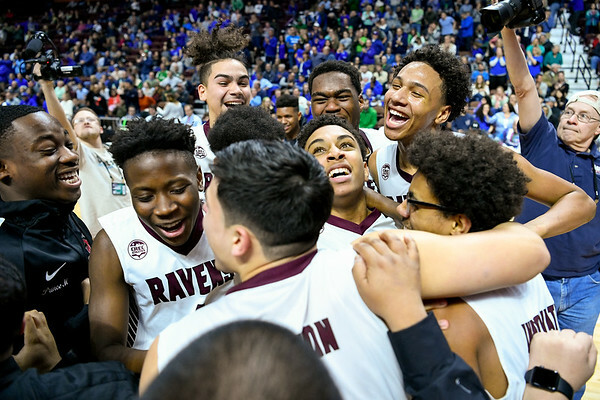 The top-seeded Ravens (24-2) won their first-ever state title by doing what they have done all year - forcing steals with pressure defense, getting consistent and sometimes intimidating rim protection, being aggressive on the boards and enjoying a balanced scoring attack. Leading 30-23 at halftime, Innovation put the clamps down on defense even harder in the second half, allowing just nine points in each of the final two quarters. The Ravens started the third period on an 8-0 run, forcing five turnovers and five straight missed shots as Old Lyme did not score until the 3:45 mark of the period. That defensive effort helped the Ravens build a 12-point lead at the end of the third, as LJ Hazelwood scored 10 of his 14 points in the quarter on 5-of-6 shooting. Innovation forced a steal on Old Lyme’s first possession of the half, and Hazelwood’s tip-in shot started the second-half run. He scored on back-to-back layups, and Lester Emanuel’s layup on a full-court pass from Ramiesh Bogle gave his team a 38-23 lead with four minutes left in the quarter. Hazelwood then scored on another putback, and his stop-and-pop 10-footer in transition put the Ravens ahead 44-32. Innovation broke free for more fast-break buckets in the fourth, and a 14-6 run was highlighted by Armoni Alonso’s “and-one” play and was capped on a pair of Bogle free throws for a 20-point lead with three minutes left that jump-started the Ravens’ championship celebration. Innovation tallied 11 steals as part of 21 forced turnovers and blocked nine shots. And after being outrebounded 25-12 in the first half by the third-seeded Wildcats (21-6), the Ravens controlled the glass in the second half, finishing with a 39-36 advantage on the boards while putting three players in double figures. Emanuel led the Ravens with 15 points on 6-for-9 shooting and had two blocks. Hazelwood added nine rebounds, two blocks and two steals to go along with his 14 points on 7-for-9 shooting from the field; Okonya scored just five points, but racked up 12 boards and three blocks; and Bogle chipped in 11 points, four steals and two blocks while battling foul trouble for much of the game. The Ravens trailed 10-3 midway through the first quarter, the first time they have seen a deficit this postseason since trailing in the opening moments of the quarterfinals against HMTCA. But they responded with a 9-0 run to close the quarter, as Carlos Gonzalez’s 3-pointer at the buzzer gave Innovation a 12-10 lead. After the Wildcats tied the game at 13 on a layup by Brady Sheffield, Gonzalez buried a deep 3 for a 16-13 advantage at the 5:25 mark of the second quarter, and the Ravens led the rest of the way. Raymond Doll hit a 3 for Old Lyme a minute later to cut its deficit to two, but Hazelwood’s quick dump pass set up an Okonya layup, and Okoyna later buried a 3 from the wing for a seven-point lead. Bogle knocked down a corner trey with 1:45 left in the half to give the Ravens a 30-18 cushion, and they led by seven at the break. After losing by two points in the quarterfinals last year to eventual state champion Cromwell, the Ravens used the heartbreaking defeat as offseason motivation. Okonya also believes that Innovation’s tight 42-38 win over Valley Regional in Wednesday’s semifinal game was a more draining experience. Ravens head coach Matt Lance took over the program in its third year. He was an eighth-grade assistant when Innovation did not win a game in its second season. And now, his Ravens will raise a banner in their home gym to cap off a program-building legacy. Old Lyme: Liam Holloway 0-1-1, Olin Fredriks 2-1-5, Brady Sheffield 4-1-11, Connor Hagan 1-1-3, Jack Bocian 0-0-0, Quinn Romeo 0-0-0, Raymond Doll 3-4-11, John Almy 0-0-0, Aedan Using 3-2-8, Jared Ritchie 1-0-2. Totals: 14-10-41. Innovation: Armoni Alonso 2-2-6, Carlos Gonzalez 2-1-7, Lester Emanuel 6-3-15, LJ Hazelwood 7-0-14, Lenny Okonya 2-0-5, Charlie Lugo Jr. 0-0-0, Gabe Matias 0-0-0, Ramiesh Bogle 4-2-11, Alonzo Hill 0-0-0, Quron Martin 0-0-0, CJ Allen 2-0-4, Julian Figueroa 0-0-0. Totals: 25-8-62. Three-point goals: Sheffield (O) 2, Doll (O), Gonzalez (I) 2, Okonya (I), Bogle (I). Records: Innovation 24-2, Old Lyme 21-6. Posted in New Britain Herald, Innovation on Sunday, 17 March 2019 15:47. Updated: Sunday, 17 March 2019 15:50.